The scope of the project included a new elevator lobby and reception area featuring curved ceilings and specialty stone; conference rooms and private offices with extensive glass and custom millwork; open workstations; a media room; lunchroom, wellness room; and pantries. 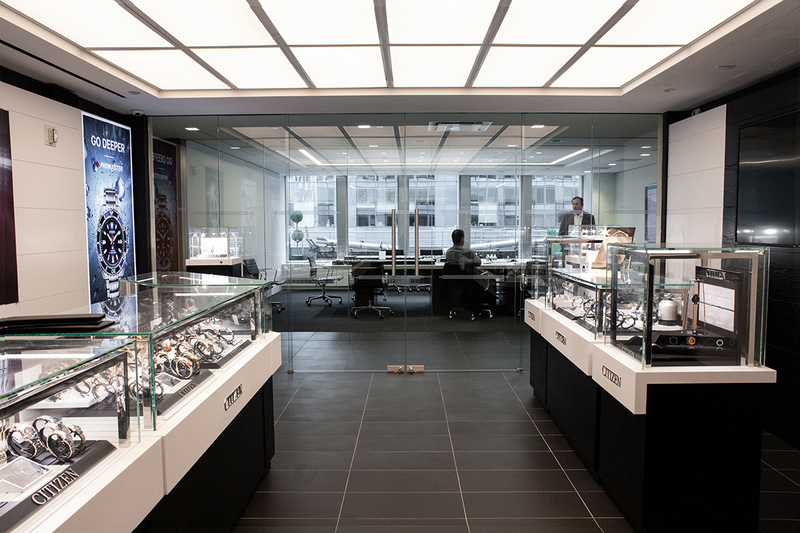 A special requirement for Citizen Watch was a merchandise product room and retail set-up showroom, which included LED lighting set in a matching pattern recessed within the floor along with custom, high-gloss ceiling panels. The LED lighting reflects onto over 11,000 watch main plates strung on 1,226 vertical cables. The main plates were manufactured in Citizen’s Japan factory and serve as the foundation for the watch movement and all the various parts. The showroom installation was designed by Paris-based DGT Architects in conjunction with lighting and sound direction by Yutaka Endo. The initial installation appeared in Baselworld and Milan Design Week in 2014 and the concept was re-engineered for Citizen’s corporate office. The showroom also provided access to one of the two large terraces, featuring bison wood pavers.